Back when I was Tina Davis, my first experience with the Aussie was in the late '70s. My 4-H leader Bernadette Gilman of Aquaroo Aussies brought her demo dogs to our training classes, where I was working with my Sheltie. Her dogs were silly and big and they had crazy eyes and they made me laugh. For my birthday in '77, I somehow convinced my mom to let me have a puppy out of Bernadette's Aquaroo Cream Soda bred to Papillon of Meshlacon. I loved Junior Handling and Obedience. I showed market lambs and was fascinated by meat judging, was raised around halter horses and also spent a great deal of time in a show cocker kennel so I was getting a well rounded education on structure and developed a good eye for balance. I was exposed to so many cockers by grooming and evaluating litters, I must say I learned the most from Helen Johnston who lived right up the hill- how convenient! She taught me how to groom and her daughter Patti and I were BFF's and that is how I got started in 4-H and met Bernadette. I started going to the ASCA shows with Bernadette and I was amazed at all the beautiful dogs. I was also embraced by equally beautiful people like Pat Hutchinson of Looking-Glass, Leone & Bob Arlandson of Circle A, and Cheryl Whited of Goshawk. Needless to say I was hooked. I bred my first litter born January 1st 1981. Raising puppies is a lot of work and a huge responsibility! I decided I would not be doing that again until I had my own place. Lucky for me I married a wonderful country boy named Willie Beck. We built an upscale boarding facility right here next to our house and we are fortunate it has all worked out and we can stay home with the dogs. I am one to appreciate a fine aussie when I see one and I am always looking! 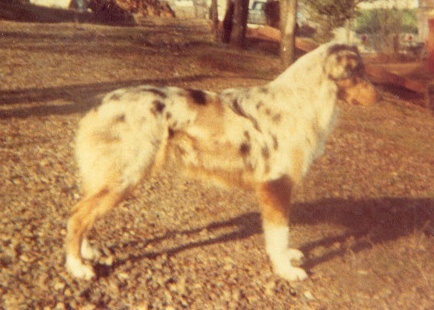 There are several outstanding breeding programs that continue to produce the style of aussie I like so you will most likely see a fair amount of McMatt, Tri-Ivory, and Heatherhill dogs in the Goldcrest pedigrees. I try hard to find individuals that are of great type and exceptional beauty and breed for that style with consideration for sound temperament and health. Most of our dogs are co-owned with friends we all enjoy this sport and this wonderful breed together. I am so grateful to all who have helped me over the past three decades, who share the vision and appreciate the unique characteristics that set the Aussie apart. With popularity comes the responsibility of those who truly love the breed to preserve and protect. I actively support the ASCA and USASA breed clubs and adhere to their code of ethics. I am an active member of ASCRV and Sierra View ASC. I am also a member of Southern Oregon KC. We must all work together to keep the breed strong and true to the written standard. Here is a picture courtesy of Pat Hutchinson. 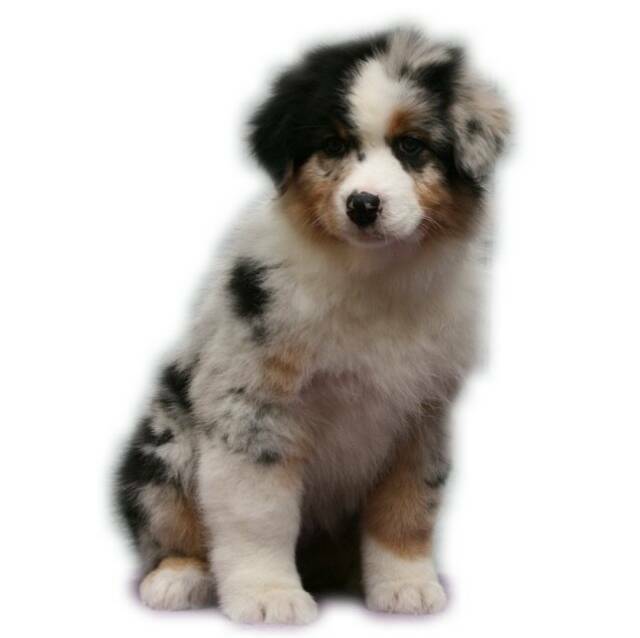 He was Cheryl's pick puppy out of my girl Megan bred to the stunning Buster Brown, my first aussie litter. Thank you Cheryl and Pat.